HARVARD VICTORY II 15-IN-1 MULTI-GAME TABLE: The Harvard Victory Gaming table from Sears packs 15 games into one. The games include soccer, air-powered hockey, pool, table tennis, baseball, football, chess, checkers, shuffleboard, backgammon, bowling, playing cards, horseshoes, ring toss and darts. Two built-in drawers provide accessory storage. A 110-volt motor provides air-powered hockey action. Included are all the accessories needed to start playing, and that makes this gaming table cost-effective. ARACHNID INTER-ACTIVE 6000 ELECTRONIC DARTBOARD: The Inter-Active 6000 and its optional interactive Heckler feature make fun of a poor effort and praise a super performance. This dartboard delivers 27 different dart games, an 8-player score display, 15.5-inch target area, LED display of player game and cricket scores, micro-thin segment dividers that dramatically reduce bounce outs, trademarked tournament colors, ranking features, voice prompt for player to throw, solo play feature and player handicap feature. The board has AC operation and can be powered by 4 AA batteries. Most importantly, it's safe, because it uses soft-tipped darts. AUTHENTIC PACHINKO GAME: This Pachinko game hails directly from the famous Ginza Pachinko Parlor in Tokyo. As you turn the knob, steel balls are propelled into a maze of spinning wheels, bumper-action pins and bonus pockets. Lights flash, bells ring and music plays when balls trigger the jackpot, earning extra playing balls. Each player begins with 50 balls and the one with the most balls at the end wins. Moving parts constantly change the odds to challenge skill levels. Not a reproduction, each reconditioned machine was originally built for commercial, round-the-clock use in an actual Japanese pachinko parlor. Face designs may vary. Constructed of wood and steel, each comes with 400 balls. Plugs into any standard household (120v) outlet. BUBBLER CD JUKEBOX: Deliver tunes to your fun room with this retro jukebox. Rock-Ola Music Corporation has reproduced the popular jukebox with its "Series V Bubbler". Watch bubbles of air perk to the top of the eight bubble tubes, while a kaleidoscope of colors flows through four color translucent plastic cylinders. It's the '50s all over again when the changer flips the 100 CDs right in front of you. All 19 trim pieces are die-cast metal, triple-plated with copper, nickel, and polished chrome. Fine hardwoods adorn it. The speakers provide 900 Watts of peak power. 1950s RETRO STYLE DESIGNER SERENADE DINER BOOTH: This commercial-grade 1950s-style diner booth set comes covered in Cascade Zodiac (glittery/metallic; many colors available) Vinyl Fabric and includes two 30-inch-wide seating booths and a 27-inch-by-30-inch table mounted on a chrome column pedestal. SIGNTIME NEON SIGNS: Signtime offers a variety of items, including beer, business, custom, nostalgia and sports-related neon signs. 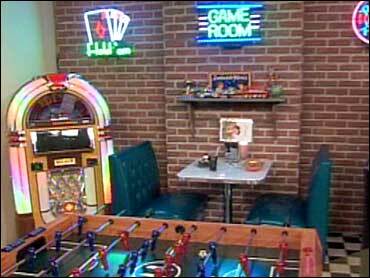 Neon signs help put your personal signature on your home game room. They plug into any standard electrical receptacle and are easy to hang or mount. ARCADE LEGENDS: Arcade Legends comes in a full-sized cabinet with a Wells-Gardner monitor and real arcade controls, including two joysticks, 3-inch trackball and buttons. Arcade Legends is now available in a cocktail table version as well. Arcade Legends comes with 35 games and is expandable so you can add more games as they are released. Fall Out Boy lead singer Patrick Stump performs at MTV's New Years Eve Bash 2005 in New York. The Chicago band sold 70,000 copies of their new album in one week after the music was featured on the popular skateboarding game "Tony Hawk's American Wasteland." CANNES, France - Music scout Tim Riley hopes to discover the next Fat Joe — but has no intention of giving him a record deal. If Riley finds the right sound, with the right Latino hip-hop attitude, he will sign the act straight away, for the third video game in the hit "True Crime" series. "If everything lines up it's an amazing opportunity for an artist," he said. Riley has already helped launch several new groups in his job as worldwide music executive for U.S.-based game maker Activision Inc.
As consoles become ever more sophisticated, game budgets swell and record majors cut back their artist and repertoire departments, video gaming increasingly offers big breaks for musicians and, potentially, new revenue for labels. Chicago band Fall Out Boy sold 70,000 copies of their new album in one week after the music was featured on "Tony Hawk's American Wasteland," a skateboarding game, Riley said. "They weren't on the radio," he said. "The only thing you can attribute the sales to is the game." When Electronic Arts Inc. bought Selasee's single "Run" for its "FIFA 2006" soccer game, the Ghanian reggae singer had yet to sell a song. Sales of his first album have taken off since the game's October launch; iTunes and Napster now stock it. Now based in the United States, Selasee regularly plays large venues. Video games may account for only a tiny share of the music industry's $21 billion global revenue, but record companies are watching closely. "It's a very small but very interesting growth area," said Adrian Strain, spokesman for IFPI, the industry's global trade body. The impact of games on music sales will increase sharply if — some say when — consoles let players buy tracks or albums directly online. "We'll have massive uptake when we have one-click purchasing from games, and from TV shows," said John Booth, business development associate at Sony Computer Entertainment Europe, at the Midem music business gathering in Cannes this week. "And that's coming." Microsoft Corp.'s latest console, the Xbox 360, is not currently configured to allow music to be bought online or transferred to another device. But sales through the company's own MSN site have taught the U.S. software giant to respect game music's potential. "We're selling lots of Xbox music on the downloads site," said Jon Kertzer, business development manager for MSN Music. "There's lots of interest." Video games increasingly carry tracks by well-known artists alongside songs by promising unknowns. Rapper Snoop Dogg and Green Day's Billy Joe Armstrong have featured in earlier "True Crime" and "Tony Hawk" versions — both on the soundtracks and as characters within the action. 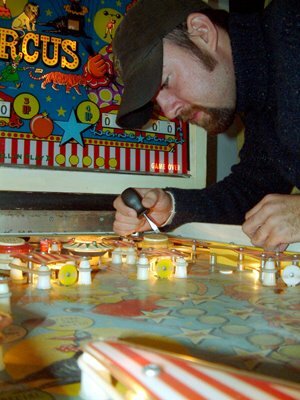 Twenty-five-year-old Seth Mundy works on dilapidated pinball machines as a hobby. 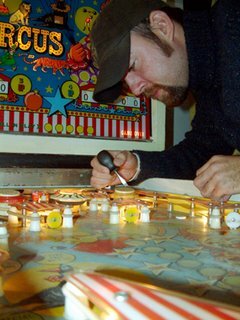 Though the small building next to his house used to be a beauty parlor, Seth Mundy does not tinker with straightening the curls out of women's hair.Instead, the 25-year-old spends about two hours every other day curling and re-splitting the 28 miles of wire inside the inoperable pinball machines he works on as a hobby.When the former seventh-grade math teacher was working in Myrtle Beach, he passed by a yard sale and saw his first machine sitting on someone's manicured lawn. Mundy said he realized right away that he couldn't pass up a pinball machine for $20. Since he was 10 years old, he was fascinated by the machines because they are "more real than a video game because you're actually controlling the flippers." The only problem was, it didn't work, and Mundy had never attempted any mechanical work in his life. "I drove everybody around me crazy for months asking them if they knew anybody who knew how to work on these things," said the classically sentimental Mundy, who also collects rock albums and sells original Nintendo games on eBay. "I finally found this old guy who had worked for an amusement company for the boulevard on the beach. I got his name from this guy who owned a skating rink. He had been working on those machines for years. "And, like the Karate Kid's Mr. Miyagi and Daniel Laruso, Mundy and Van Owens, of Conway, started working together. Owens said his father had worked on pinball machines and he has been working on machines since he could get a wrench in his pocket at age 12 until recently at age 64 because of disabilities. Under the name "Pinball Wizard," from The Who's rock opera, "Tommy," Owens said he enjoys "playing with people" in chatrooms, but not as much as working on the classic machines. "I love to work on them. It's a part of my life," Owens said. "I would be out there if I could work. You better believe I'd be out there busting my rear end fixing them. "But teaching and helping Mundy repair the machines was just the right medicine for Owens to stay active in his passion and to pass on his knowledge. "Seth is crazy like I am. He ain't got no sense. He's crazy," Owens said in a joking uncle-like tone. "I enjoy it because someone can learn it and carry it on. I don't mind showing nobody nothing." Owens claims that since he was struck by lightning at a young age, it "scared the electricity out of (his) body." Since then, Owens said he can tinker around in pinball machines without getting shocked. Mundy said Owens' "abilities" never ceased to amaze him. "He could stick his fingers in a lightbulb socket and would say 'now don't you touch this,'" Mundy said. "You need a Popsicle stick to touch all these things inside and he'd just be grabbing them like it was nothing. "Since Mundy moved back home to Greenwood, he said he has worked on and restored about 10 machines, making every effort to restore them instead of taking parts from different machines to make one good one. He said he usually buys machines for about $100 and has sold a few for as much as $1,000. "I've never really bought a machine that just works," he said, "which would be really nice for me because I would love to have one I can just play. "Mundy said a lot of people from the baby-boom generation seem to enjoy pinball machines for romantic reasons, bringing back childhood memories. But he said he was more surprised when his friends and people who had never mentioned liking them before started playing the machines whenever they came over. "None of my friends or people I knew mentioned anything about wanting to play," he said. "But when I had four to five working, that's all they wanted to do was sit out there and play." Parents Play Video Games Too! A new study sponsored by the Entertainment Software Association (ESA) reveals that about one in three parents of small children plays video games.The research found that thirty-five percent of American parents, who have children between the ages of 2 and 17 in their households, say they play computer and video games. Among these “gamer parents”, 80% report that they play video games with their children, and two-thirds (66%) feel that playing games has brought their families closer together.The study also found that a typical gamer parent (defined as parents who play computer and video games but do not solely play desktop card or children’s games) is 37 years old, almost half (47%) are women and have been playing games for an average of 13 years. In addition to highlighting the fact that video games are increasingly becoming accepted family entertainment, the sponsors of the survey are also using the research as evidence that the government should get its nose out of regulating video games sales in an attempt to protect kids from exposure to violent and/or sexual video game content.The study found that 85% of parents with small children believed that parents not government, retailers, or game publishers, should take the most responsibility in monitoring childrens’ exposure to games that may have content that is inappropriate for minors.